Do you have problems checking your JAMB CAPS? Is your CAPS not showing your information like below? This happens to some candidates. And if it happens to you too, follow the guide below to show your details. In case you don’t know how to check your JAMB Caps, follow the guide below. 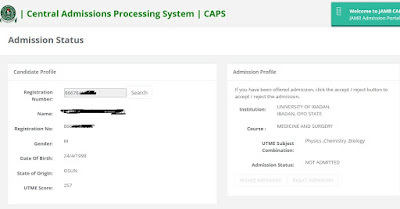 The page for your admission status will display. This resulting page will show the next stage in your admission process. See the interpretation for each stage and message.